Huawei's two representative tablets, say MediaPad 7 and MediaPad 10 FHD, have left us deep impression for their streamlined interfaces, high-resolution screens, high-end CPUs, etc. Before getting the answer of importing and playing DVD on Huawei MediaPad, let's take a look at the specific information of its two flagships first. Huawei MediaPad 7 packs in 7-inch display with 1024x600p resolution. This Huawei tablet is powered by Cortex A8 1.2GHz processor with 1GB of RAM and runs on Android Ice Cream Sandwich. Huawei MediaPad 10FHD has definitely hit the tablet world by storm and claims a strong 10-inch display with an amazing 1920x1200 high-definition, supporting 1080p HD video playback. In spite of wonderful features that offer excellent movie watching experience, Huawei MediaPad, similar to iPad, Samsung Galaxy Note, Surface, etc, still has the heel of Achilles. Due to the lack of DVD drive, many users, like John, cannot play DVD directly on Huawei tablet, no matter MediaPad 7 or MediaPad 10 FHD. In this case, you need to rip DVD to Huawei MediaPad friendly format first. For the sake of converting DVD to Huawei MediaPad supported format, you can count on a DVD ripper for Huawei tablet. Luckily, MacX DVD Ripper Pro is the perfect solution to help you copy and rip DVD to MPEG4, AVI and H264 that Huawei MediaPad 7 and 10 FHD recognizes easily. This DVD ripper is highly acclaimed among a huge number of customers, attributing a lot to its high video quality and fast ripping speed. Delightfully, regardless of all copy protections put in place on DVD, such as Disney Copy Protection, Sony ARccOS protection, CSS encryption, etc, this DVD ripper for Mac handles all DVD movies you throw at it and finishes DVD conversion smoothly. So you can feel free to transfer and import you DVD to your gadget on Mac. Below is the step-by-step guide to rip DVD to Huawei MediaPad 7/10 FHD on Mac. Rip and convert DVDs to MP4, AVI, WMV and other format supported by Huawei mediapad tablets on Mac(El Capitan incl.) and Windows(Win 10 incl.) with the original movie video quality reserved. MacXDVD Software provides two versions to finish DVD to Huawei MediaPad tablet ripping. For windows users, you can download Windows Version DVD ripper on your PC. Free make this DVD ripper download on Mac OS, hit "DVD Disc" button to import new movie DVD releases you want to rip. Alternatively, you can import this disc by hitting "DVD Folder". You can hit "to Huawei Pad Video" listed on Android Pad from the drop-down list, and choose the video format H.264 or MPEG4 as output video format. Here take "Huawei MediaPad 10 FHD" as example. Alternatively, you can kick off "Huawei MediaPad 7" or "Huawei Ideos S7 Slim" as your output format in case you want to convert DVD to Media Pad 7/Huawei Ideos S7 Slim on Mac. Tips: for those who want to crop, trim and merge video files, simply click "Edit" button on the right side of the title as you need. Start importing and ripping DVD to Huawei MediaPad 10 FHD on Mac by clicking "RUN" button. 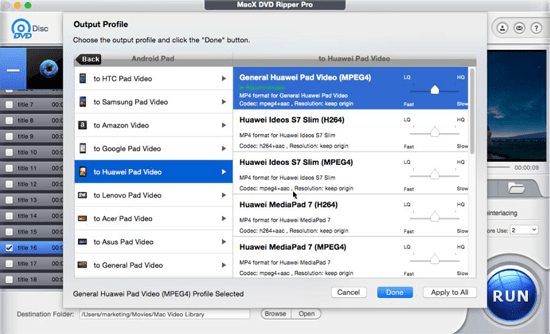 This newly upgraded DVD ripper for Mac demonstrates a great leap from the previous version, offering more than 300 output profiles for you to convert DVD to MP4, DVD to FLV, DVD to iPhone, DVD to iPad, DVD to Samsung Galaxy S7, DVD to HTC, DVD to Huawei Mate 10 (Pro), etc. Its Mac style user interface offers a unique experience for beginners and professionals, making DVD conversion an easy 1-Click solution. BTW, if you desire to play the converted DVD video on your new iPhone 7/7 Plus, you can apply MacX MediaTrans to transfer video from Mac/PC to iPhone iPad iPod for replying without limits. This article gives you an effective way to rip DVD to Acer Iconia tablet, especially the Windows 8 tabs for you to rip DVD to Acer Iconia W700 and W510 and play DVD on Iconia with ease. The following DVD to iPad/iPad 2 guide shows you how to transfer DVD to video/audio format for playback on iPad/iPad 2, thus you can freely enjoy your favorite DVD movie on your iPad or iPad 2 anytime and anyplace. Follow this tutorial to convert DVD to HTC Flyer Tablet compatible video/audio formats for playback on the go. Notice: We only advocate using this best DVD ripper to rip commercial DVDs to Huawei MediaPad under the concept of Fair Use and do not encourage any illegal reproduction or distribution of copyrighted content. Please abide by the local DVD copyright law before doing it.